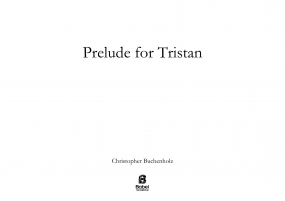 Christopher Buchenholz is an American composer whose orchestral, chamber, vocal, and piano works have been most favorably received in the United States and abroad. His compositions are best known for their extraordinary blend of traditional musical sound worlds, relentless counterpoint, intricate rhythmic aggregations, and innovative harmonic motion. His music has been described as “meta-tonal,” incorporating tonal structures and tonally influenced relationships within fundamentally twelve-tone designs. 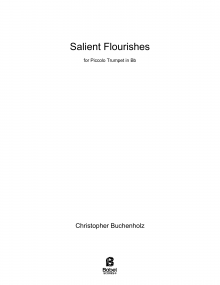 Dr. Buchenholz’ music reflects an intense and ongoing investigation of formal musical structures, created in a twelve-tone pitch-space, which itself is modeled after a more conventional, tonal pitch-space. This lends his music a familiar, yet strikingly new sound. Dr. Buchenholz, currently Adjunct Assistant Professor of Music at Hunter College of the City of New York, recently served as Special Projects Coordinator for The Leonard Bernstein Office Inc. and as a Visiting Lecturer at the National University of Ireland Maynooth. He has also taught at Columbia University, Yeshiva University, The Juilliard School, The American Musical and Dramatic Academy, the Association to Benefit Children, and New York University. A native New Yorker, he began his musical career at the age of seven on CBS Sunday Morning. He also performed as a soloist with the Metropolitan Opera from age eight to fourteen. He has performed at The Public Theatre, and The Kennedy Center, and has toured with the Philadelphia Oratorio Society. Dr. Buchenholz studied at the High School of Music and Art. He studied composition at Carnegie-Mellon University with Lukas Foss and Leonardo Balada, and with Milton Babbitt at the Juilliard School, where he received both a Bachelor and a Master of Music. Thereafter, he studied Clarinet with Allen Blustine, and Composition with Joseph Dubiel, Jonathan Kramer and Fred Lerdahl at Columbia University where he was awarded a Doctorate with distinction. Dr. Buchenholz’ Commissions include Speculum Musicae, The Frelinghuysen Foundation, The Arditti Quartet, The Carnegie-Mellon Baroque Chamber Ensemble, The Carnegie-Mellon Philharmonic, Cuarteto Latinamericano, All Saints Church in Pasadena CA, The Disney Family Foundation and The National Arts Club. 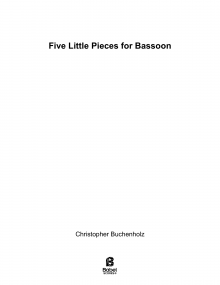 Christopher Buchenholz has received awards and honors from The Schubert Foundation, The George Gershwin Memorial Scholarship, The Gretchaninoff Memorial Prize in Composition, The American Academy of Arts And Letters, The Dr. Boris and Eda Rapaport Prize, and The Henry Mancini Fellowship in Composition.